The NRA Marksmanship Qualification Program is an easy, rewarding way to improve your shooting skills. Below you will find links to score cards you can print, cut out, and use at the range to track your progress. For the Handgun Qualification, you will begin shooting simple groups, then progress to timed targets using both your strong and weak hands. Print out your free score cards from this PDF link, and then cut out one card for each participant. 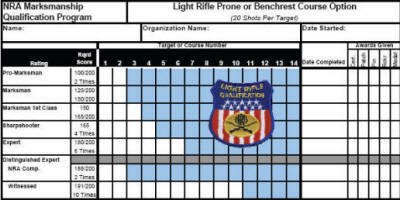 For the Light Rifle Qualification, you choose from one of three courses of fire. Each course of fire has its own scorecard. Print out the score cards from this PDF link, and then cut out the card for your chosen course of fire. You will need the Acrobat Reader to download and print these cards.